Emma Bonino. Flickr/European University Institute. Some rights reserved. Donato Paolo Mancini: More than 22,000 people have died in their attempt to reach Europe through the Southern Mediterranean since 2000. Does the new EU-wide emergency strategy on migration - saving lives, protecting refugees, prosecuting human traffickers, distributing migrants among members on the basis of hard numbers and quotas - work? 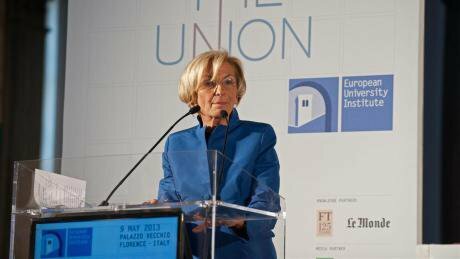 Emma Bonino: Even if it was publicised as a strategy to “save lives”, the new EU-wide policy does not entail an explicit search and rescue operation at sea. The protection of refugees can still be improved - the current strategy provides for between 20,000 and 40,000 places, yet demand is irrefutably higher. Nonetheless, positive steps have been taken, especially with regard to the quota system. It remains to be seen whether this provision will survive the Council of European Ministers of Home Affairs, where member states are represented and decisions made through a qualified majority voting system. The UK - which enjoys opt-out rights, like Denmark and Ireland - has already voiced its opposition along with Spain and France. Other members, like Hungary and Poland, are likely to follow suit. Indeed, the proposal risks being reduced to only one aspect: the so-called “fight against human traffickers”, which only deals with migrant boats in the Mediterranean, without tackling the entire system that supports trafficking. UN options have so far been limited, for it remains to be seen whether a resolution will be necessary in June, as Libya still doesn’t have a government that is willing to collaborate. Organised by militias who are in conflict with one another, and who are likely to violently retaliate if hindered, human trafficking is a very lucrative business. There is no one, single, miraculous solution: intervention must be concerted and coordinated on all fronts. The new policy is a sound, bold proposal that must be supported, for it would require all members states to fully take responsibility for the management of the emergency. National notions of self-interest are likely to prevail, however. Diplomacy will have to work incessantly, and I hope Italy will endeavour to support the initiative until late June, when the European Council is set to legislate. DPM: Do Frontex and Triton work? EB: Frontex was assigned an inappropriate task through Triton: controlling borders. The sheer numbers of lives lost at sea prove it was a total failure. A thoroughly conceived mission in the Mediterranean should, today, deal with active search and rescue, exactly as was the case with Mare Nostrum, Italy’s search and rescue strategy discontinued in late 2014. It isn’t only about budgets: the mandate is important, too, as there currently isn’t one to intervene in terms of immediate search and rescue. The final decision made by the Council ordered explicitly that Triton respect marine law and international treaties, so that covers the rescue mandate, but doesn’t provide for active search. Even if no longer sanctioned by law, the Italian Coast Guard is de facto continuing Mare Nostrum: the idea of losing lives at sea is simply not acceptable. Tens of lives of migrants have been saved during the past weeks, and the Italian Coast Guard, fishermen’s associations, and NGOs bear the entire responsibility. DPM: Is it irrational to think of completely open borders? EB: The most pressing issue is to calm the collectivised hysteria that has taken hold of Europe, for it serves the politics of some, but doesn't reflect reality. Millions of individuals are fleeing wars, dictatorships, torture, and the threat of death — and not only in the Mediterranean: it's a structural, global problem. The answer can only be political, and it must set the safeguarding of human life as its central priority. In terms of comparison, it helps to look at the situation in other countries: Tunisia has welcomed a million Libyans into a population of around eleven million; Jordan - population: seven million - has harboured 700,000 Libyans. Lebanon, with four million inhabitants, has welcomed over a million Syrians. It would be - it is - preposterous not to welcome in the same way those who flee horror. Regrettably, most probably for political convenience, these numbers are rarely publicised. In general, we should abandon the hypocritical stance of 'closed borders'. In today’s world, no frontier is really closed. Migrants are only let in legally to do legal work; or they’re let in illegally - in a display of total hypocrisy - oftentimes jeopardising their very survival, and making them vulnerable to organised crime. DPM: Do you see any particular risk scenarios in Northern Africa, and is the EU dealing with them appropriately? EB: Besides the turmoil in neighbouring countries, an extensive social conflict is ongoing in Algeria. A rather closed power system is in place, and there are no really viable candidates to succeed President Bouteflika. Until now, local revolts have been sedated through a kind of clientelism that fed on oil revenues and a strong police system. So far, both the EU and Algeria have counted on the historical memory of the 90s civil war: people fear another wave of bloodshed. With its 40 million inhabitants, its reliance on oil revenues, and the aforementioned social conditions, Algeria can certainly be described as a time bomb. Europe isn’t doing enough on this front: rather than acting upon the done deed, we should be able to anticipate and prevent these scenarios. We’re still caught by surprise. Politics in the Mediterranean cannot be dealt with monolithically: policies are to be implemented on a case by case basis, and it is exactly for this reason that we can’t treat eastern Europe like we treat the southern Mediterranean. I campaigned for the establishment of a Mediterranean Commissioner, but Junker’s Cabinet didn’t accept my proposal. A unique, one-size-fits-all foreign policy will not benefit us in the longer run. DPM: Does the EU need more or less political integration? Can a scenario like Brexit align itself with the humanitarian issue? EB: The recession of recent years clearly shows more political integration is needed, at least if we are to respect democratic representation. Otherwise, crucial policies are indeed coordinated - e.g., the closure of borders - but not as result of a debate and public deliberation. The UK threat to leave the EU and strategic unwillingness to collaborate on migration issues is being staged to avoid a No vote in the 2017 referendum - if one takes place - and a subsequent government crisis, but it entails far larger consequences. With scenarios akin to Brexit, not even one refugee could be harboured. And if the UK counted itself out, then Denmark would follow suit, as would Ireland, Spain, France. There would very likely be no more internal redistribution. As a consequence, Europe would be seen to have failed in the peripheral countries that harboured the greatest proportion of migrants and refugees in the first instance. It would be a political failure — a vicious circle, one that isn’t conducive to realistic solutions. DPM: What future prospects do you envisage for the civil liberties you have long campaigned for in Italy? Ireland recently voted for marriage equality for all its citizens through a referendum. Twenty years ago, homosexuality was penalised. There exist several contradictions - abortions are still illegal, but it's an important result. I would be happy to see the EU elicit more progressive law making in Italy, but this hasn't been the case. The challenge we face is transforming the will of the majority of citizens, largely progressive, into actual political decisions.